Owning an old home with history tied to it can be a wonderful experience. With newly built homes lacking a rustic aesthetic, it’s unsurprising that older homes are highly sought after. In Canada, these types of homes are commonly referred to as heritage houses and contribute to our country’s history. Of course, not all older homes are considered to be historic. Canada’s Historic Places states in order for a location (whether it be a house, landscape, or group of buildings) to be considered a historic site, it must be formally recognized for its heritage by someone of authority. In Edmonton, there are several heritage buildings including The Hotel McDonald! 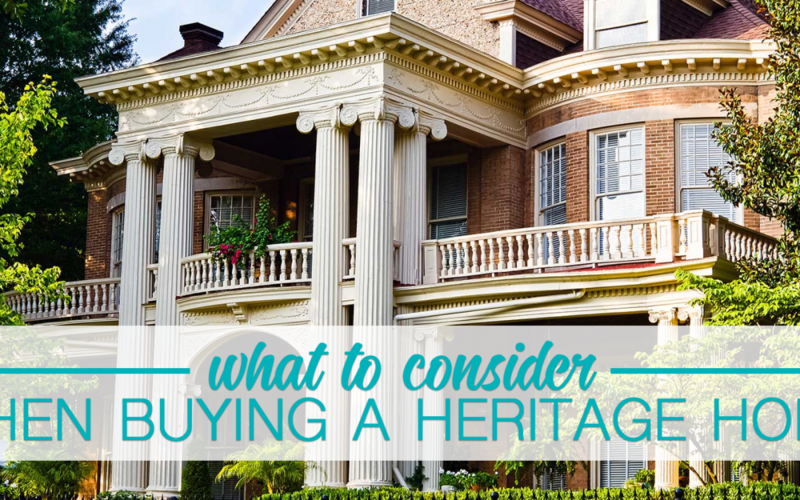 If you do decide that you want to buy a heritage home, there are some factors you should consider. For plenty of homeowners, having free range when it comes to making changes to the home is important. However, if you want to buy a heritage house, you’ll be rather limited. Homes that are either considered to be a heritage home or are in a designated heritage district cannot be drastically altered. There are rules in place to preserve the authenticity of the home. For instance, if you want to replace a front window, you would need to get approval and have it replaced with an exact replica. As mentioned in the previous point, heritage homes are essentially under the protection of the government. Certain renovations (especially those to the exterior, if your home is located in a designated heritage district) will require a Provincial Heritage Permit. These permits can take quite a bit of time to obtain, which may delay the renovation process. Maintaining the look of your heritage home can be expensive. Rory McDonnell, a general contractor who works on restoration and heritage work, says renovations can cost up to 50 per cent more. To own a heritage home means you have to appreciate the features of the home that give it its heritage status. Therefore, properly budgeting for future renovations is extremely important. However, owning a heritage home isn’t terrible. Along with those extra responsibilities comes the feeling that you’re keeping history alive. By looking after the home, you ensure that people will have access to history. Not to mention that there are charming characteristics of the home you won’t find in houses anymore! Approaching the government for permission to renovate may seem stressful, but you can still make the home your own. While new houses seem to share a similar colour palette and design, heritage homes have a wide range of architectural styles. If you’ve ever wanted to live in a home built in the Victorian era, then you definitely should consider investing in a heritage house. On the inside, these houses can have antique fireplaces with intricate details along with beautiful staircases! For more information regarding heritage homes or designated heritage sites, visit the Government of Alberta’s website.